You know that dish that everyone always begs you to bring to the backyard BBQ even when you really really (really) want to bring something different for once, so you end up making both, and then they barely touch the new dish that took you *forever* to prepare and that you were so excited about bringing, but completely devour your regularly requested one? Souvlaki Pita is that dish for me, the dish I will never escape. Good thing it’s pretty darn tasty. I could probably eat it every week without going crazy. I may or may not be speaking from personal experience. I’ve searched high, low and even under a few beds, but I just can’t find good pita bread in Wichita. I can find “pita pockets”, which are small thickish pita’s that you can cut in half and split open to make a pocket, or “pita bread” which is a small, thick and dry thing with no pocket inside. Pita bread for souvlaki should be soft and thin enough to be able to wrap around the filling, similar to how you would wrap a soft shelled taco. Yes, I realize that I should simply make my own pita bread. I haven’t yet found the motivation (or a recipe that doesn’t scare me; I’m not a baker) to go that route, so I use the pita pockets. 2 lbs grilled souvlaki. Use chicken, pork or both. 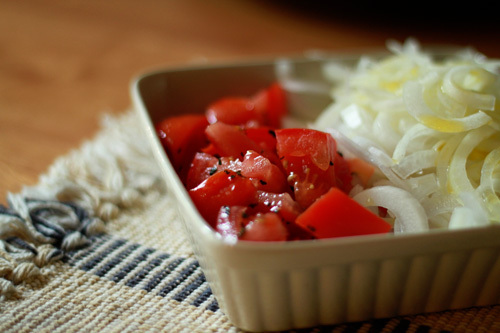 Mix the tomatoes with the oregano and 1 tsp olive oil. To remove some of the bite from the onions, soak then in cold water and the vinegar for about 10 minutes. Drain, then soak them again in fresh, cold water for an additional 10 minutes. Drain and pat dry. Drizzle the onions with a bit of olive oil before serving. 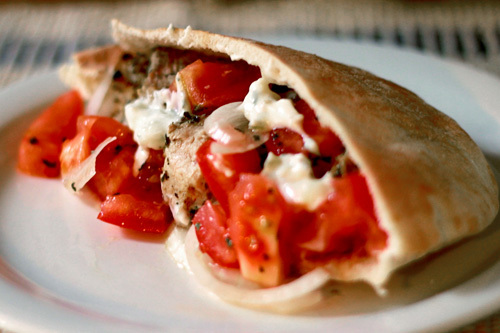 Fill the pita with souvlaki, top with tomatoes, onions, any additional toppings you choose, and plenty of tzatziki. Get a napkin ready, then take a big bite and enjoy! If you want to mix things up a bit, you can also use shredded lettuce, feta cheese and/or some chopped olives for toppings. Your blog is beautiful, great photos and delicious recipes. I will be back to enjoy your posts. I’m not lying when I say that I sometimes eat tzatziki with a spoon. I am definitely going to try your souvlaki recipe. I made homeade pita bread last month, and it turned out surprisingly good (and was easy!). But, I used chicken…and the marinade diddn’t really have that much flavor. I have a feeling I won’t have that problem with this. Thanks for sharing! This looks incredible. I would beg you to bring this to my BBQ too! beautiful photos. What a wonderful recipe! I love Greek food and never thought about trying it myself. So I did the suvlaki/pita dish. It tasted great! 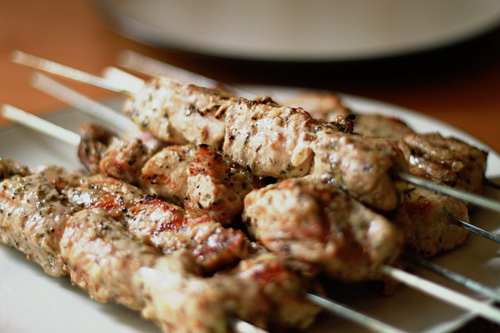 Next time we will try the souvlaki with rice and salad. It’s so nice to hear that you cooked and enjoyed this recipe. It’s great with the rice and salad too. A nice oven cooked rice pilaf would be great!